PARMENIUS, STEPHANUS (in Hungarian István Paizs(os) or Budai Parmenius István), scholar, traveller, probably the first Hungarian to visit North America; d. 1583. He tells us he was born of Christian parents in Turkish captivity, i.e., in the pashalik of Buda after 1541, and that he was educated by learned men before being sent, about 1579, to complete his education by a tour of European universities. 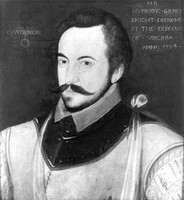 On reaching England about 1581 he formed a friendship with Henry Unton, an English gentleman, later ambassador to France, who may possibly have visited Hungary and who became his patron. At Oxford he lodged at Christ Church with Richard Hakluyt the younger (who refers to him in the “Discourse of western planting” as “my bedfelowe in Oxforde”), and became friendly with the Puritan president of Magdalen College, Dr. Laurence Humfrey. Parmenius was a Calvinist and it is probable that he took introductions to London Calvinists with him in 1582; the Huguenot printer and publisher, Thomas Vautrollier, printed for him a short religious work in verse, Paean . . . ad psalmum Davidis CIV (1582), with a dedicatory poem to Henry Unton. He renewed a close acquaintance with Hakluyt, who was then busy preparing publicity for several American colonizing ventures, and was introduced by him to Sir Humphrey Gilbert. Parmenius became so enthusiastic about Gilbert’s proposed voyage that he published a poetic tribute in Latin to the venture, De navigatione illustris et magnanimi aurati Humfredi Gilberti, ad deducendam in novum orbem coloniam (London, 1582). This provided encouragement, if little factual information, for participants in the project, but it demonstrated the author’s command of classical parallels and also the careful teaching on English maritime achievements he had had from Hakluyt. Hakluyt reprinted it in 1600 (Principal navigations, III, 137–43, with the slightly confusing date 31 March 1583). Unton, already a friend of Gilbert’s, may have subscribed to the expedition, but Parmenius decided to go himself and to record what he saw. 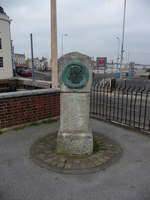 He left Plymouth on board the Swallow, to whose captain, Maurice Browne, he later paid tribute, and had, he said later, a fine voyage, all the men being in good health when they entered St. John’s harbour, Newfoundland, on 3 Aug. 1583. Edward Hayes, however, tells us that the Swallow’s crew were largely pirates, and being short of food when they reached Newfoundland, they attacked and stripped a French ship, losing two of their own men through carelessness, for which the crew and ship were sent home by Gilbert from St. John’s. Parmenius made some slight attempt to explore the country around St. John’s and to penetrate into the interior, but everywhere the forests were blocked with dead timber and were thus impenetrable, for Gilbert refused to use fire to clear a way. Parmenius shipped in the Delight under Capt. Browne, who had exchanged with Capt. William Winter, when she sailed on 20 August for Sable Island and Cape Breton. On 29 August the ship was in difficulties in shallow waters and went aground in bad weather, breaking up rapidly. Parmenius was not one of those whom Richard Clarke brought to safety in the ship’s pinnace. He was drowned on Sable Island, or conceivably Cape Breton. Edward Hayes got home and explained that Parmenius had “adventured in this action, minding to record in the Latine tongue, the gests and things worthy of remembrance, happening in this discoverie, to the honour of our nation, the same being adorned with the eloquent stile of this Orator and rare Poet of our time.” By his premature death was thus lost an embryo chronicle of the voyage and perhaps also the beginnings of an epic poem. BM, copies of Parmenius’s two pamphlets. Hakluyt, “Discourse on western planting”; Original writings (Taylor); Principal navigations (1903–5), VIII. A[biel] H[olmes], “Memoir and poem of Stephen Parmenius of Buda,” Mass. Hist. Soc. Coll., 1st ser., IX (1804), 49–74. Voyages of Gilbert (Quinn). C. S. Emden, Oriel papers (Oxford, 1948). István Gál, Magyarország Anglia és Amerika (Budapest, ). W. G. Gosling, The Life of Sir Humphrey Gilbert (London, 1911). L. L. Kropf, “Budai Parmenius István,” Századok, XXIII (1889), 150–54. Correspondence between the author and Dr. György Pajkoss, National Széchényi Library, Budapest. David B. Quinn, “PARMENIUS, STEPHANUS,” in Dictionary of Canadian Biography, vol. 1, University of Toronto/Université Laval, 2003–, accessed April 19, 2019, http://www.biographi.ca/en/bio/parmenius_stephanus_1E.html.